I am now unemployed. As I’ve got my free time extended I thought I might as well start hacking some GTK app to learn how to do it. I decided to make a visual schnauzer (like in Xv). So far I’ve come up with thumbnail creation (loading if existing else creating and saving) and simple browsing. No viewing or such yet. Now don’t nag me about this one. It isn’t even an official project yet. But if it evolves into something more than a hack and it really is usable I will ofcause release it. No point in releasing something that fills no purpose. 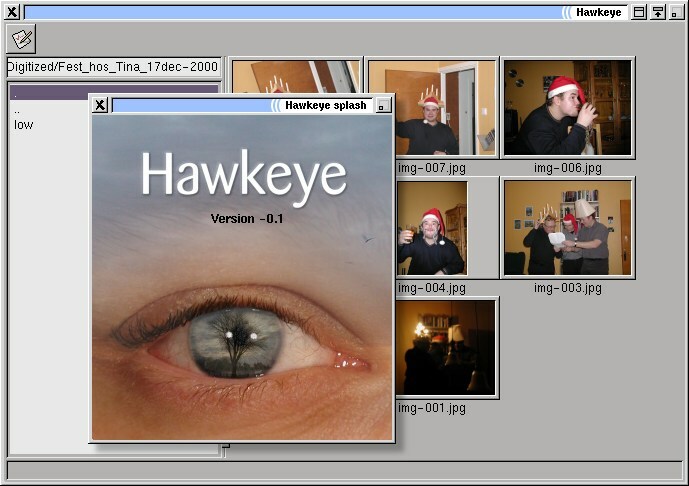 I’d prefeer gphoto2+gtkam to evolve into something like ACDSee+Olympus Camedia (for Windoze)… yes I’m lazy =). This is the result of approx 24 hours of coding, some gimping (yes… the splash window doesn’t really exist and enlightenment doesn’t have such cool shadows under the windows… but the eye-with-a-tree-in-it-image does exist). No use of gui-builders like Glade or even GladeXML. Pure spaghetti-coding 😉 (yes… the code ain’t pretty… but it compiles! (sometimes… sometimes not!) ). The images you see in the thumbnails are better not explained as the people in front of the camera is under influense of alcoholic liquids.